“It uses a unique water and oil based formula that will make it more durable, outlasting the competition. “This primer will protect the surface from harsh weather and discoloration from outer paint layers bleeding through. Many exterior paint brands like to make their products as multipurpose as possible. It is common to see paints you can use indoors and out on a variety of surfaces. This doesn't necessarily mean a paint you can use on virtually anything is the best. KILZ’s Exterior Siding, Fence, and Barn focuses on working outdoors, so you can be sure it will stand up to the test of harsh weather. It uses a unique water and oil based formula that will make it more durable, outlasting the competition. This is a smart choice if you are looking for something that won't peel or crack as much. Even though it takes longer to dry (2-3 hours initially, 6-8 permanently), it will stick well to surfaces like wood and masonry. A gallon of paint will be enough to cover 200 square feet on porous surfaces or 500 square feet on smoother surfaces. For something that will resist fading or weather damage, this one is hard to beat. Painting floors and other ground surfaces provides an extra challenge when outdoors. Along with the usual weather, the paint has to resist people and furniture as well. 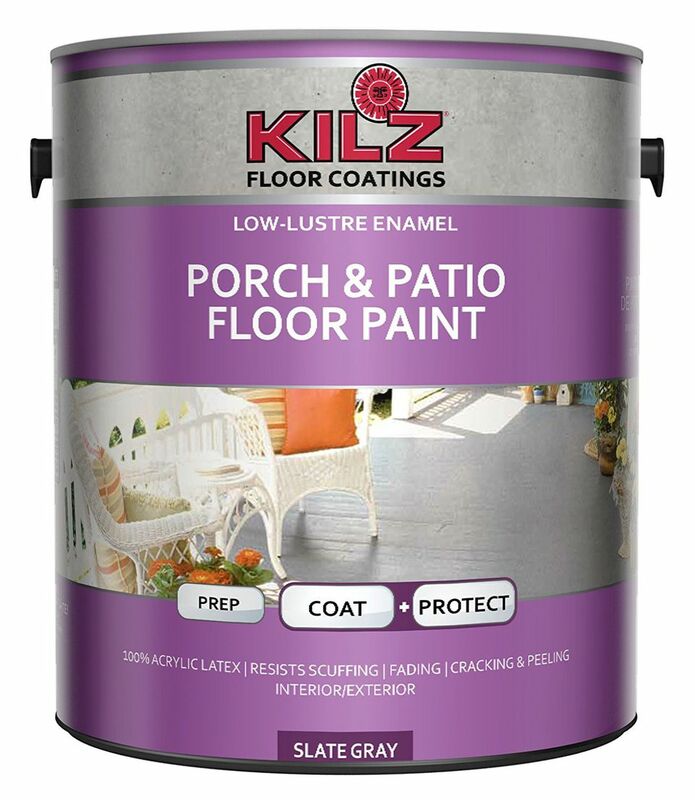 KILZ’s Interior/Exterior Enamel Porch & Patio Latex provides this extra protection with the addition of an enamel layer. Enamel paints dry into a glassy, durable finish that gives most floors an extra shine and finished look. As a latex paint, it also is easy to use, clean, and dry. If you live somewhere wet, the finish includes mildew-resistant film. This offers additional protection to wood surfaces that may begin to rot with repeated exposure to moisture, and makes it perfect for exposed floors on porches, decks, paths, and around pools or hot tubs. Initial drying time is one hour, but you can apply additional layers after 6-8 hours if necessary. Exterior paint usually supports the saying, “You get what you pay for.” If saving money is important to you, however, the Rust-Oleum 1990502 will give you the same type of protection as other exterior paints in a smaller supply. This is a water-based acrylic type of paint. In reality, this is just another word for “latex,” so you can expect the same quick drying times and easy painting experience as with other latex brands. For the price, this paint is good for small projects or touch ups. You can use it outdoors and inside on various woods, plasters, masonry, or even certain types of metal. It is also a good option if you need a quick drying time of just 30 minutes. Once everything is said and done, you will have a nice, flat finish to enjoy. A multipurpose latex paint is a great way to save money and headaches on large projects. For a paint to do double or triple duty, it needs to adapt to different types of surfaces ranging from smooth to rough and porous. The KILZ 2 Multi-Surface Stain Blocking Interior/Exterior Latex starts all this off as a multipurpose primer. Primers make other paints stick to tricky surfaces, so you can paint over it with any color you want. This primer will also protect the surface from harsh weather and discoloration from outer paint layers bleeding through. KILZ 2 is almost necessary if you have a surface with strong colors, stains, or previous damage. For wood, brick, metal, and indoor surfaces like drywall, it does a great job of covering up deficiencies and protecting the underlying surface. You will also get a lot for the money. A one gallon can should cover around 300-400 square feet, which will be more than enough for small to medium projects around the house. The only way to have ultimate paint durability is to go with an oil base. The long drying time is usually worth the wait when you need something to survive harsh weather and high surface traffic. The Diamond Brite Paint 31000 is meant for these types of surfaces. Whether it is wood, masonry, metal, brick, stucco, or plaster, this is the paint to turn to when covering stains, cracks, and previous paint layers. The mildew resistant alkyd finish will resist rust and other water damage. This makes it one of the most reliable choices for painting industrial and commercial exteriors. To pull double duty, you can also use this paint for indoor applications if you need extra protection from use, rust, or even common household chemicals. A good primer is key for having the perfect finish. In most cases, top coat paints won't offer the type of protection needed to keep your outdoor surfaces protected for years at a time. When you need the best for marrying top coats together with tricky surfaces, Rust-Oleum’s 2004 Zinsser Bulls Eye is one of the best choices. The water based formula makes it easy to apply and provides a protective seal once it has dried. If you don't have time for properly preparing your surfaces, this paint can be applied to most surfaces as is. No sanding or other primers are needed since the water based formula clings to unprepared surfaces. It will also resist rust and water damage, making it the obvious choice for metal and wood surfaces outdoors. An aerosol version is also available if you need to spray hard to reach areas around the house. Some paints provide the color or shine to a finished surface while others excel at protection. KILZ’s Premium High-Hide Stain Blocking paint is the one you should turn to when an extra layer of protection is required to keep your outdoor siding and fencing looking good. Unlike primers, you can use this paint at any point during the painting process. It goes over or under other latex and oil based paints, so you can use it to reinforce the basic primer you use or as a top coat sealant. While you can use the KILZ Premium on many different surfaces, it excels with woods and other porous materials. When used as a top coat, it is a perfect choice for wood stains you want to keep dry and consistent. In highly humid areas, it also resists the growth of mildew damage and mold, so the underlying wood won't begin to rot. Finally, the low odor and easy cleanup will help make the painting experience easier and more enjoyable. Some projects simply require bulk. When you have a lot of siding, fencing, or even a whole barn to paint, five gallon cans will save you time and money. Valspar 3125-70 Barn and Fence paint offers the same level of exterior protection as other paints on the list at a cost effective price. The paint is easy to brush or roll on, and will stick to most vertical surfaces like wood, masonry, and various types of steel or aluminum sidings. This is a no nonsense paint. Paint and let dry. Once it has dried, you can reasonably expect it to resist fading from sun damage or erosion from the weather for years.